Well, it finally happened. Gah! I’m so sorry! Normally, I put out one post at least once a week and I have even made it a personal goal to make sure I have them completed and submitted on Sunday nights by midnight. I do my best to be consistent. Well, this past Sunday I missed that deadline and here it is the following Friday and I’m finally getting to catch up. This has been the first time since I’ve started this site that I’ve missed my personal goal. For that reason, I’d like to explain. One of the hard things for me when it comes to blogging is deciding on how much of my personal life I should share. It’s a tough choice for me for a variety of reasons. Trust me, I’m sure the last thing anyone wants to hear about is my personal life. This is a blog about warlocks and who wants to hear about my real life when they visit hoping to read about ‘locks and Warcraft right? Well this week, real life hasn’t been fun for me. In all actuality, it’s been a stark reminder of why we should never take for granted our family and friends, and what we do in life whether it’s in the game, or out in the real world. Two things happened that gave me a sobering wake up call. First, I have an elderly parent going through a major surgery and sadly the second thing that occurred was that I lost a friend. While my parent’s operation was planned and it was expected, the death of my friend was truly a sucker punch to the gut. My friend was young, a loving father for two beautiful children and great husband to a lovely wife. He was a good friend to me, and I’m a better person for having known him. In the every day struggles of life it’s often easy to lose sight of what’s really important when you’re bogged down in all the busy details. Getting lost in the weeds happens to all of us, and it’s understandable how we can easily lose our sense of direction. Then we get a wake-up call, you know what I mean? Call it a shock, or a jolt, or a sucker punch, but something occurs that smacks our perspective into focus so crystal clear that everything else seems trivial. Everything else seems small and not necessarily as important as it once appeared. This week has been that for me, a wake up call. I’m still goofy old, despicable me – only with a little more perspective tossed my way. When life hits you with events like this it often makes me think of a famous Ralph Waldo Emerson poem called Give All To Love. The last line says it all, “Heartily know, when half-gods go, the gods arrive.” It’s quite fitting. You can read the full poem here. It’s just a game right? If there is one thing this week has taught me, it’s to enjoy your time and make the most of it. 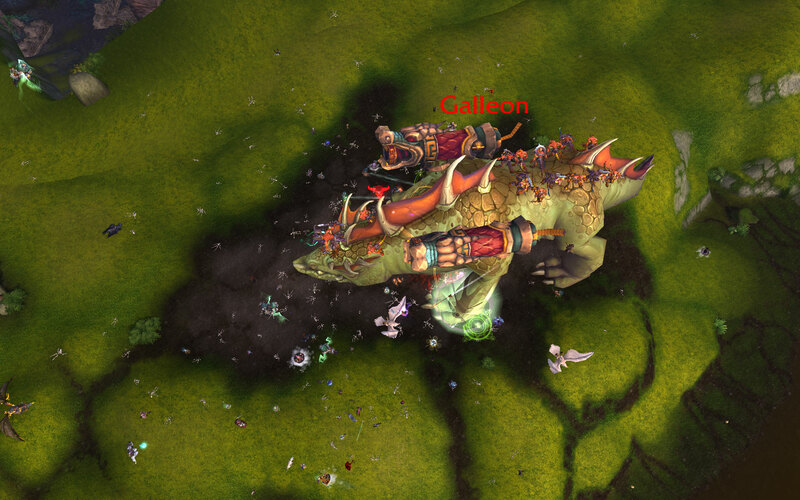 So whether your wiping on a raid boss, or angry that you’re sitting at a spirit healer because the opposing team took you out, or even if a precious rare mount didn’t drop from a boss you brought down for the 200th time…have fun and know that things could be much worse in life than the trials and tribulations of playing a video game. I love emails because it’s like a box of chocolates…you never know what you’re going to get and I really do enjoy them all :) So here’s a few I’ve received that I thought you’d enjoy too. Been listening to your segments on The Instance and CTR for a while now and they’ve been pretty good, but I’ve been having a small niggle at the back of my mind on them that I figured wouldn’t hurt to email you about – it’s your use of the term Global Cooldown (GCD) as opposed to Cooldown (CD), especially in calling Infernals/Doomguards a 10 minute GCD, and the T90 talents 1 and 2 minute GCDs. The GCD is separate but similar to the actual CD of a spell. Most spells trigger the GCD (but not all), and most spells have a CD or resource cost. The case in point is that if casting Infernal triggered a 10 minute GCD then you would not be able to cast any spell that was on the GCD (read: most of your spells) for 10 minutes! (and, same logic to 1 minute GCD on Kiljaden’s Cunning and 2 minute GCD on Archimonde’s Vengeance.) I’ll explain further. The standard GCDs is 1.5 seconds, some modifications to this – some classes have a base GCD of 1.0 seconds (Rogues, DKs etc). Spellcasters (but not melee) get to lower their GCD with haste. Some other things affect the GCD – you may remember back in the old long-style talent trees there was a Warlock talent that lowered the GCD of curses, letting you cast them 0.5 seconds quicker when they were already instant cast. This is an example of something that has no CD on use, but is still on the GCD. So we now know that most abilities trigger the GCD, and can have a separate cooldown of their own (such as Infernal etc). A few more examples to clarify the difference between the GCD and CDs: a Warrior’s Heroic Strike has a CD of 1.5 seconds, but is not on the GCD, so you can hit HS at the same time as any ability that is on the GCD and they can go off at the same time. Most defensive cooldowns (see most tanking CDs) are not on the GCD, but have long cooldowns, between 1-3 minutes. So, in future, it might be better to say “X ability has a Y minute cooldown, and ; on the Global cooldown” – this is a lot more accurate than calling the CD of the spell it’s GCD, and can give some pretty valuable information..I haven’t played a Warlock myself since Wrath, so I can’t call any specifics on what abilities you have that are off the GCD (since the changes in Cata, and Mists), but I don’t doubt you’ll have some on your bars and even if there are no class specific off the GCD abilities for locks, there’s still on-use trinkets. Knowing what abilities you can stack together in the same button press or press at the same time because they’re off the GCD is important for playing your class well. Yep, Josh did a great job of calling me out on a mistake I didn’t realize I was making. Thanks Josh, I’d hate to confuse anyone on what I mean and you’re right, I meant the Cooldown (CD) and not the Global Cooldown (GCD). Sometimes, I use the terms as one in the same – bad habit I know and I’ll do my best not to make it again. Hey Amijade, you’re despicable – I heard about warlockery.com from The Instance podcast. 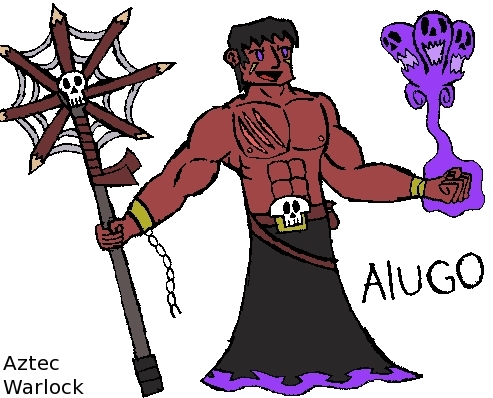 I drew this picture and used digital techniques to color, but i thought you might like it, considering that he’s a warlock just like you. Amijade, say hello to an Aztec Warlock. If you like this picture, you can find more digital art at My Website. Great pic! I love the Shadow Bolt’s flying off his hands! I’m not in the music video, those are my friends. I liked the song so i posted it on my site. And i don’t really play WoW, but when i was little, my dad played it a lot, and he let me try out his Night Elf Druid every once in a while (but warlocks are pretty epic, too). I listen to the Instance because i like to keep up with WoW, and to get new ideas for my games. Tell Hukrath i said hello. 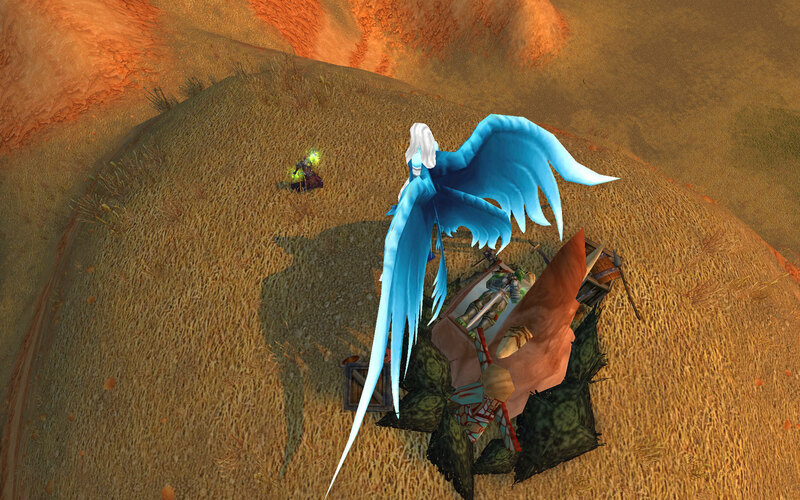 Hey, don’t you think it would be cool if (in a MoP patch) warlocks could summon Sha demons? The Sha are basically demons made of negative emotions, so when your warlock inflicts shadow damage or something, he could build up some kind of dark energy that he could use to summon a Sha! Warlocks are despicable and I think you are despicable too! Do you do the demon voice or do you have a friend do it? I like Hukrath and think you should use him more in your spots or maybe use a different demon too. If you do the Observer, you could just make the licking noises. I still think that’s nasty because you never know where that person has been. Thanks Tyrinia! Having been a warlock for so long, I often see being called despicable as a badge of honor. Hukrath, my voidwalker, is actually voiced by me and gets the cool minion like sound when I use the magic of a free audio recording program called Audacity. I add a few special effects to my voice recording and then use a technique known Reverse Reverb. That’s it :) I thought about trying to use a different demon voice, but trust me when I say that I can’t sound like a Succubus or a Shivarra no matter how hard I try. Impersonating one of the other demons might work and I just might try that. Although, it would be difficult to give up using Hukrath, he’s been with me since the beginning and if the truth be told – I think people enjoy hearing him more than me! Ha! I’m not kidding and your email is proof of that! I plan to get another post out this weekend to review some of the changes to warlocks in the next patch. Woot! They sound deli-cious and I don’t know about you, but I’m really looking forward to running the “Warlock only” quest line. We got some new glyphs and another new spell. So much to talk about and so much to do! 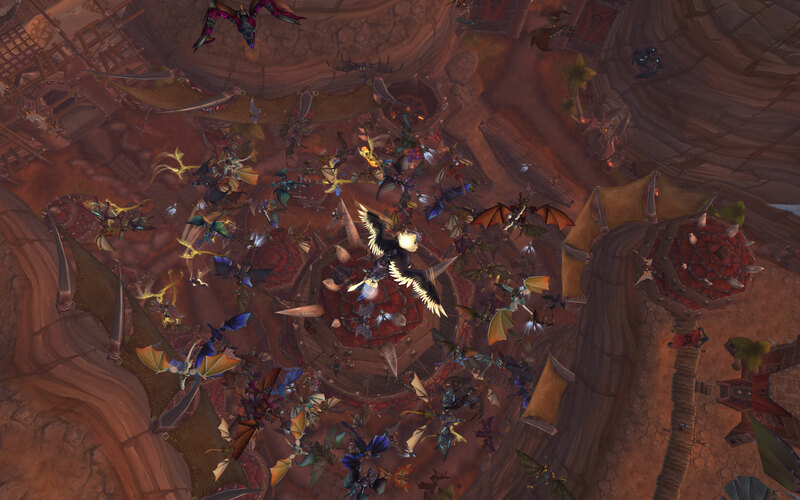 After our guild memorial walk from the Tomb of the Fallen Warrior all the way back to Orgrimmar, we celebrate life with friends by flying around the city. I can’t remember if I posted this shot before or not, but it’s still impressive. I only wish you could see the number of flying mounts that were above me!